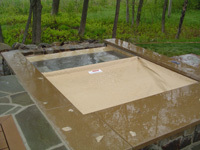 Automatic pool covers are a safe, convenient way to ensure your pool, or spa, remains the source of fun and enjoyment it was meant to be. You can open or close your pool in approximately 60 seconds, with just a turn of a key. Automatic pool covers roll up and away for easy storage.